The Excel Punch Clock template is basic time sheet template allows to record the punch in time and punch out for employee shifts and wage calculation. 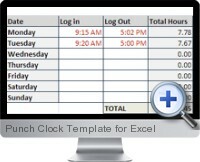 The weekly punch clock template can be either used within Excel or printed to be completed manually by employees. Calculation of time between start and end times. Standardized format for importing time data into central system.